Police in Alberta say a woman has died after trying to stop her dog from attacking a toddler. Officers have determined that the dog, a boxer-pitbull cross, was attacking a toddler before turning on its owner, a 50-year-old woman. The woman was pronounced dead at the scene. "In an effort to stop the attack on the toddler, an adult female intervened and the dog turned the aggression on her,” Staff Sgt. 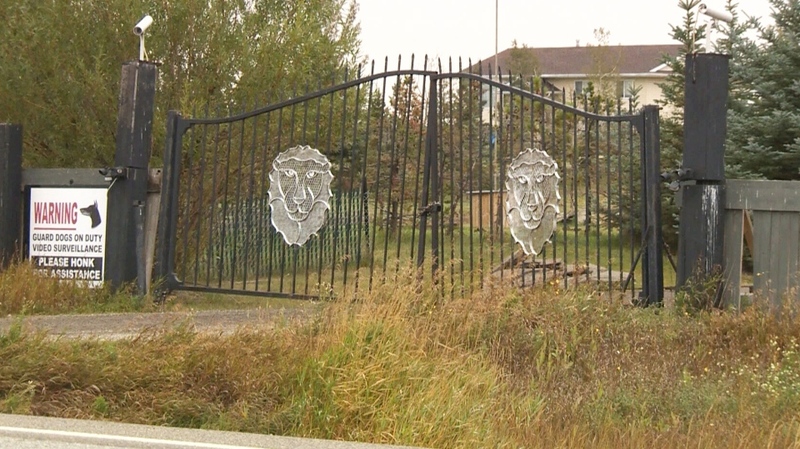 John Spaans, with the RCMP's K-Division, told CTV Calgary. The toddler was transported to hospital with serious, but non-life threatening bite injuries to her arms and legs. The identities of the victims have not been released. Police say other people at the house were able to subdue the dog and put it in a kennel. It and another dog have been put in a quarantined facility in Calgary. There is no indication the second dog, a purebred boxer, was involved in the attack. The dogs will be held for 10 days while they are tested for diseases. Officials will then decide what to do with the animals. Witnesses say the dog had no prior history of aggression. Spaans added an early investigation determined the toddler was not provoking the animal. A house in Langdon, Alta., where police say a woman was killed by her dog after it attacked a toddler, on Saturday, Sept. 15, 2018. Police say a woman was killed by her own dog in Langdon, Alta., on Saturday evening.